The Haverford Township Free Library offers Roku 3 Streaming Media Devices, for streaming movies, Netflix, channels, and more! 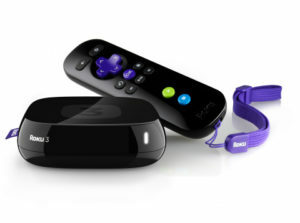 A Roku can be checked out by any adult with a library card in good standing. To use a Roku you must have an HDTV and a high-speed Wi-Fi internet connection. It can be borrowed at no charge for 3 days, but there are no holds. For more information, please call the Reference Desk at 610-446-3082 x201. Please see the attached document to view what movies are freely available in the movie library on the Roku.